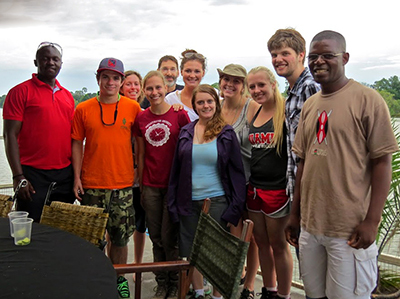 Miami students (and workshop leader, Dr. Jonathan Levy) and officials from the Zambian Environmental Management Agency enjoy some down time on a boat tour on the Zambezi River outside of Livingstone, Zambia. The Black World Studies program (BWS), inaugurated at Miami University in 1976, is an interdisciplinary program in the Department of Global and Intercultural Studies in the College of Arts and Science and is open to all undergraduates. The 6 core and 25 affiliate faculty members represent numerous departments and span several of the university's academic divisions. BWS offers a unique opportunity for students to enhance their understanding of the historical, social, religious, cultural and political experiences, values and expressions of Africans and people of African descent in the U.S. and throughout the world. It focuses on the changing constructions of race, class, and gender in local and global contexts. Moreover, the study of African diasporic communities will better prepare all students to cope with the ever-increasing demands of a multicultural world. This program stresses critical thinking, reflection, social justice and informed action. Your academic success is the main goal of every faculty member in the BWS Program. We believe that every student will learn to the highest level and we are prepared to offer more time and support to every student that needs it. The Black World Studies program (BWS) is an interdisciplinary program in the Department of Global and Intercultural Studies in the College of Arts and Science and is open to all undergraduates. Students can earn a Bachelor's degree (major) and a minor in this field of study. The program offers a variety of learning opportunities including courses, summer workshops, service projects and research.